If you love being naked and your favorite part of skiing is riding up to the top of the trail, then you're in luck. 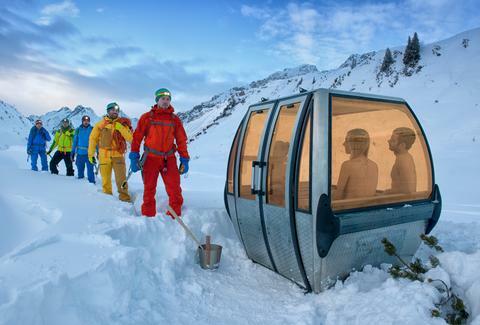 Saunas inside gondolas are now a thing. It's called the Saunagondel, and it purports to be "the best mobile sauna experience for up to four naked people," which is a pretty specific thing to be the best at. 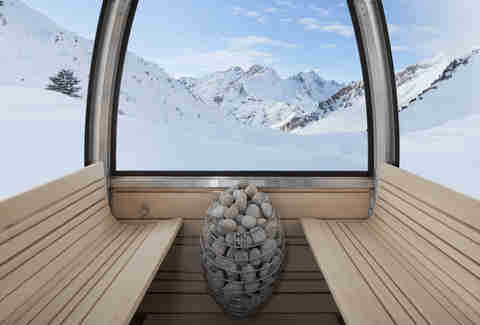 German designers Toni Egger and Felix Tarantik acquired gondolas traveling around the Swiss Alps, and they're repurposing them into these lightweight saunas with panoramic views. The gondola shells are stripped and rebuilt into minimalist eye candy with silver fir and electric heaters. The current models are constructed with gondolas from Engelberg-Titlist in central Switzerland, but Tarantik tells Thrillist that they've sourced gondolas from other locales as well and expect to release two-person and six-person models in "a few months." No word on whether these will be the best mobile sauna experience for two and six naked people, though. As a source material, gondolas actually aren't just a random design-for-design's-sake frill. Gondolas are constructed to withstand weather changes, extreme cold and altitude shifts, making them a great base for a sauna placed in extreme weather conditions. Though they're lightweight, they're capable of heating to 212 degrees fahrenheit. Even Tony Curtis knows no one likes it that hot. The interdisciplinary project involved electrical engineers, carpenters, metal workers and the German brand VAUDE, which has frequently been lauded for its track record of sustainable design. Even better, the saunas come Wi-Fi ready, so you can make sure all your friends know you have other friends that can afford the $8,500 price tag. The Suanagondels are quite unique, but like every sauna, they're bound to be dominated by that hairy guy spreading his legs a little too far apart.